The "NavGenius" is a covert GPS Tracker that's incorporated into a standard looking navigation system to monitor a driver's every move. It even comes with two manuals, one for the user of the car that doesn't mention any of the tracking features and one for the real driver of this device. Lightning GPS today announced the world's first ever covert GPS Tracker built into a fully functional touch screen navigation system, at the CTIA Wireless Technology trade show. The "NavGenius" is a covert GPS Tracker that's incorporated into a standard looking navigation system to monitor a driver's every move. It even comes with two manuals, one for the user of the car that doesn't mention any of the tracking features and one for the real driver of this device. An average GPS system such as a Garmin® or TomTom® is the equivalent of a "dumb box," like a standalone PC that is not connected to the Internet and only does what it is pre-loaded to do. 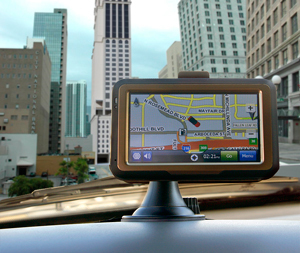 The "NavGenius" is the first true "Smart GPS" also known as "Connected GPS." By adding Internet capabilities, the GPS gains the ability to interact with, and be controlled by, other devices and services over the Internet. 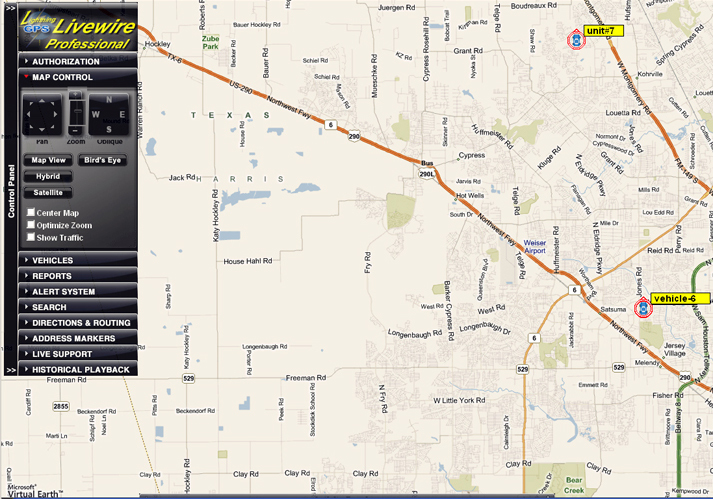 Using a slick web 2.0 online mapping system, users can easily check on a family member or any fleet of vehicles at once in real-time from any computer. Find out if they are where they say they are, or monitor their driving progress and history. Next time a teenager or employee tells you they were late because of traffic you can check yourself to see where they were and how fast they were going. You can even see a report of any unsafe driving behavior such as flooring it off the green-light or slamming on the breaks. Did you ever want to tell someone where to go? We all know it is far easier to use online mapping from a computer than it is to use a handheld device. Now you can create a complex route or find a location and automatically send the route or location to the driver over the web. They never need to pull over and fiddle with a device or risk an accident while driving. Playing with handheld devices such as cellphones and GPS units while driving is suspected to cause many dangerous crashes. The Lightning GPS "NavGenius" is designed to replace over $3,000 of older dedicated devices found in most taxis and delivery trucks. The current mess of cables and boxes include dispatch/messaging systems, GPS Tracking devices and standard GPS Navigation units; some even have a laptop for Internet access. By replacing all these expensive boxes with one low cost device under $500 fleet owners can save over $2,000 per vehicle. "Small business owners are putting a lot of faith into their delivery personnel. In some cases, the image of the company can be tarnished by the actions of a part-time high school driver," explains Jason Lazarus. "With the "NavGenius" we have given small businesses the power to monitor and control their delivery staff with zero installation and at a fraction of the cost of older systems." One of the largest regional fleets has already pre-ordered 700 devices for their trucks. There are some things you may want to be alerted to instantly such as speeding, or a driver going into a "restricted zone." With the connected nature of the "NavGenius" you can set rules on the website and get alerts via e-mail or SMS directly to your cell phone. For example, if a vehicle is only allowed to stay within town "A," and it travels outside town "A" into town "B," an alert message is immediately sent to the authorized user on that account. Many baby boomers are concerned that their teenagers and aging parents may get lost on the road or run into difficulties and need assistance. By including a GPS Tracker built into the navigation system, the "NavGenius" can alert a concerned parent about bad driving behavior or the location of a teen who is out past curfew. Like the iPhone® this is a platform that other companies are building applications for. One OEM is adding the ability to charge credit cards directly with just a small USB swiper. Dozens of apps are under development and thousands of Windows Mobile applications can be installed with little to no modifications. Just like Apple®, Lightning GPS is managing which applications can be loaded on the device. An "app store" is under development and will be announced shortly. The web-based tracking system is so easy-to-use, that Lightning GPS launched a Free Live Demo that requires no training at all to get started. Availability: The Lightning GPS "NavGenius" will ship in mid April, 2009. Please contact Lightning GPS at http://www.lightninggps.com directly to order through their dealer network or for server licensing and large volume orders. Volume discounts are available. 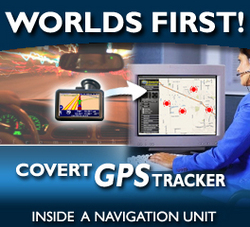 Lightning GPS is the largest provider of GPS Tracking technology to law enforcement, military, and business. Whether it is family, consumer, business, or law enforcement tracking, Lightning GPS has a GPS Tracking solution for every surveillance need. Garmin®, TomTom® Apple® and iPhone® are registered trademarks of Garmin International Inc., TomTom International and Apple® consecutively.